The Chinese gongs used by the Shen Yun Performing Arts orchestras are made out of bronze, with a large face roughly one to two feet in diameter. Their round shape has holes at the top through which a rope is run to hang the gong on a frame. 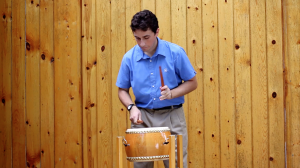 The gong is struck by a large round or flat-faced mallet, creating a powerful, rich, and resonant sound. Because of its legato character, the instrument is not suitable for playing rapid rhythms. In Shen Yun dances, the Chinese gong is often used to enhance the music’s power, accentuate its beat, or express sacred solemnity. Its sound demands and immediately gets attention. Shen Yun’s orchestras also employ much smaller and thinner hand gongs. They produce a variety of sounds and are more often used to evoke a celebratory mood. These smaller gongs are often used in tandem with Chinese drums and hand cymbals.